Mashed potatoes are such a great comfort food. We made them a bit healthier by using broth instead of cream and Greek yogurt instead of sour cream to give this recipe some extra protein, and to reduce the fat. Try leaving the skin on your potatoes for extra fiber and flavor. Combine potatoes and garlic in a large pot and fill with cold water. Bring to a boil, then cover and lower heat to medium. Simmer for about 20 minutes until potatoes are tender. Drain water, then put potatoes and garlic back in the pot. Add all other ingredients and mash together until smooth. Add extra broth if you prefer thinner mashed potatoes. Season with salt and pepper. 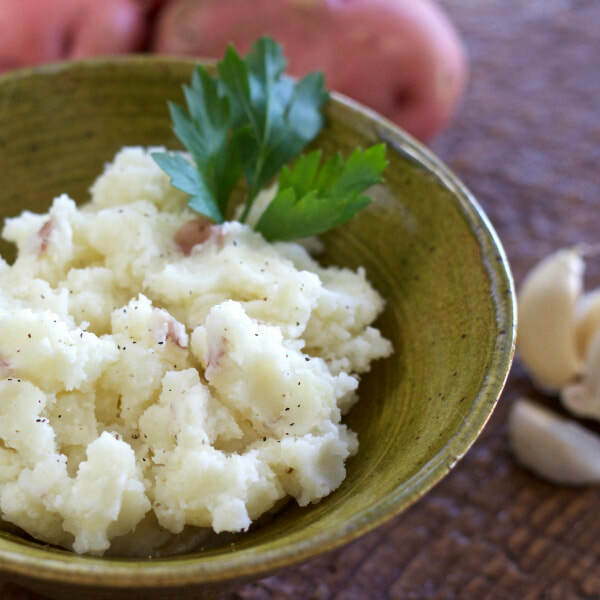 Notes: Leave the skin on your potatoes to make this recipe even healthier. Be sure to wash them thoroughly before boiling.